Chronic joint pain is a common debilitating condition affecting millions in the USA. This is usually the result of trauma, or age-related degeneration. Many patients suffer from chronic knee, hip, or shoulder pain that do not respond to conservative treatments with medications and physical therapy, causing severe limitations to the patient’s daily lives. Chronic joint pain that do not respond to conservative treatment is usually treated with surgery. Joint surgery involves significant risks of potential complications and failure. Even successful surgery involves a long recovery period . RegenaJoint was developed to provide relief of chronic joint pain without surgery by using the body’s own healing power. 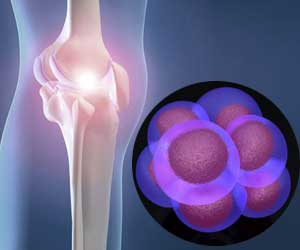 RegenaJoint combines stem cells, platelets , and growth factors that are injected right into the affected structures inside and around the joints with the help of ultrasound and/or x-ray guidance. The adult stem cells used for RegenaJoint come from the patient’s own body (autologous). These cells may be harvested from the bone marrow, fat, or both. The concentrated platelets come from the patient’s own blood. Once the stem cells are separated from the bone marrow or fat, and the platelet rich plasma is separated from the blood, they are combined with growth factors and injected into the affected joint and surrounding ligaments or tendons. This is all done on the same day and it takes about 1 hour. Step 1 : Review of medical history and imaging studies (X-rays and /or MRI), followed by a physical examination that includes a comprehensive examination of the affected joint(s) using ultrasound. This first step is essential in planning the injection procedure. Step 2 : Viscosupplementation , or injection of hyaluronic acid into the joint. This serves as a template, or scaffold to the stem cells that will be injected later. Step 3 : Collection of your own stem cells and platelets and Injection of a mixture of those, with growth factors, into the affected joint and surrounding tendons or ligaments. Step 4: Another PRP injection into the joint and tendons and surrounding tendons and ligaments. This serves as a booster to promote further growth of the stem cells. Step 5: This step involves lifestyle changes to further promote good health to your joints. A number of exercises and nutritionals will be recommended to you to continue this 5th step in treatment. RegenaJoint is an innovative, high-tech, safe, effective, non-traumatic procedure with minimal recovery time that is performed in an outpatient setting. RegenaJoint is exclusively performed at the Florida Institute of Rehabilitation Medicine. Schedule your free consultation today to determine if you might be a candidate for this state-of-the-art procedure.